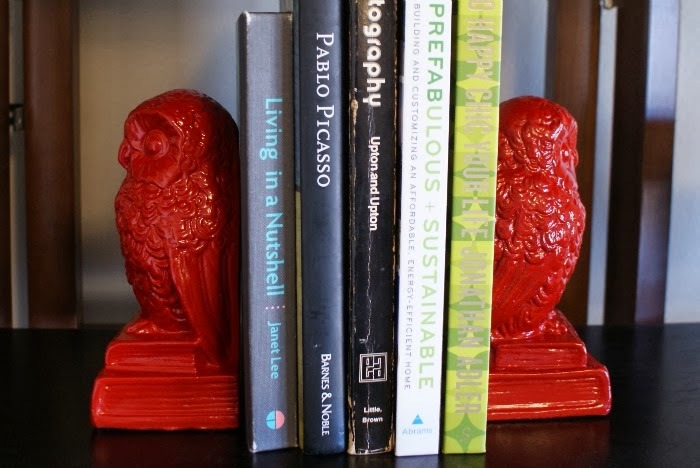 I scored these kitchy owl bookends at a gift exchange over the holidays and loved them immediately. Yes, they are completely 70's and ugly, but I thought with some bright paint they could be really fun. I figured I'd have to wait until spring because it's been way too cold to spray paint. Well, I got lucky because it was almost 60 degrees today - in January! I gave the owls a good scrubbing to remove any dust and grime, followed by a coat of spray primer. My first instinct was to paint them red, but I had extra gold paint leftover from my end table project, so I tried that. I should have gone with my gut because the gold was just not working for me. It felt like they were supposed to be eagles or something. So I picked up a can of bright red spray paint (Banner Red from Krylon) which is perfect! 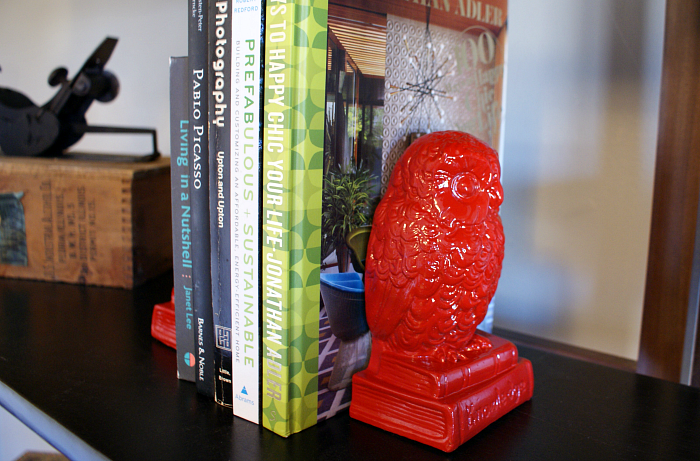 These owls were just the pop of color I needed to finish off my bookshelves! These turned out super cute! Also, I am a total book nerd and love the books in there. :) I keep meaning to check out the happy chic one!!! These are awesome! Thanks so much for linking up at Thursday STYLE! I've been searching for some bookends, and I think I'm going to just copy yours! These are so neat! Things like this make me want to scour yard sales for treasures like this. Thanks for linking up to the Thursday S.T.Y.L.E. Link Party. We hope to see you again this week! I love these. Reminds me that with a little paint everything has new life. It also reminds me that I totally need bookends! I am seriously loving this project AND your use of milk glass!